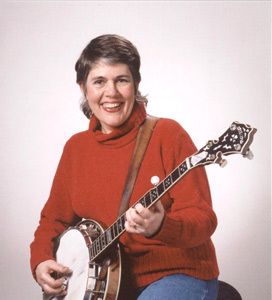 Murphy Henry, co-founder (with her husband Red) of The Murphy Method, teaches banjo, guitar, mandolin, fiddle, and ukulele. She's been teaching almost as long as she has been playing. Murphy grew up singing in church and taking piano lessons. She learned how to play guitar during the folk boom, and soon taught her sisters to play, so that she'd have someone to play with. In college (University of Georgia) she played at coffeehouses with just her guitar until, on the recommendation of Florida folksinger Gamble Rogers, she went to her first bluegrass festival and decided that she wanted to play bluegrass. She learned how to play bass so that she could take a job with Betty Fisher and the Dixie Bluegrass Band. But she quickly realized that the bass player doesn't get nearly the attention that the banjo player does, so she settled on the banjo as the instrument for her. She met future-husband Red at a bluegrass festival and not long after she graduated from UGA (with a degree in food science--of all things!) they married and started their own band--Red and Murphy and Co.
Based in Gainesville, Fla., from the mid-seventies until 1986, Red and Murphy played on the southeastern festival circuit, as well as at a lot of Florida bars and clubs. They produced seven albums and two children: Casey, in 1978, and Christopher, in 1981. Murphy taught banjo in Gainesville and when they traveled fans often lamented that they were not close enough to Murphy to take lessons in person. She had the idea of putting her lessons on cassette, so that folks far away could learn the same way her live students did. What started out as a modest six-cassette Beginners Banjo Series slowly grew to a forty-plus video, six insturment instructional method. Now based in Winchester, Va., Red and Murphy run The Murphy Method, with Red handling the technical side (editing and duplicating videos, laying out the newsletter, shipping orders, and a multitude of other tasks) while Murphy handles the creative side (developing and teaching the videos and DVDs) and gives live lessons in Winchester. (She's got to have guinea pigs to try out new teaching ideas!) The family band (formerly Red and Murphy and Their Excellent Children, now just Red and Murphy again) plays once or twice a year, while Red and Murphy play locally with other Winchester musicians. Murphy is also hard at work a book on for the University of Illinois Press to be titled, Pretty Good For A Girl: Women in Bluegrass, which will consume most of her time until it gets finished, hopefully sometime in 2010.